Are subscriptions no longer cool? I can't tell and I've never been one for being very trendy. 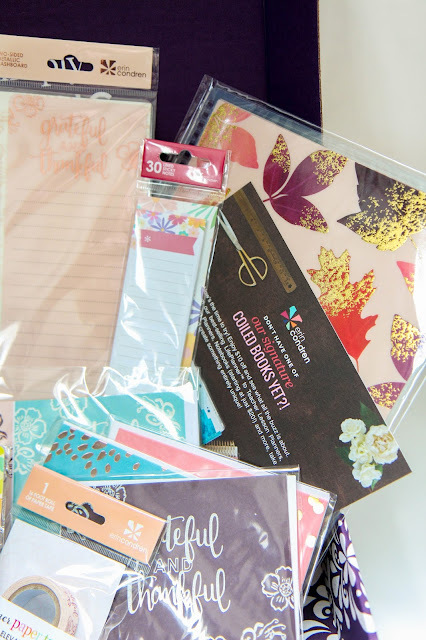 I'm still obsessed with Erin Condren's seasonal surprise box and lucky for my wallet it only comes out once every few months or I'd be seriously broke. I've also reviewed all of the other boxes if you want to check those out. 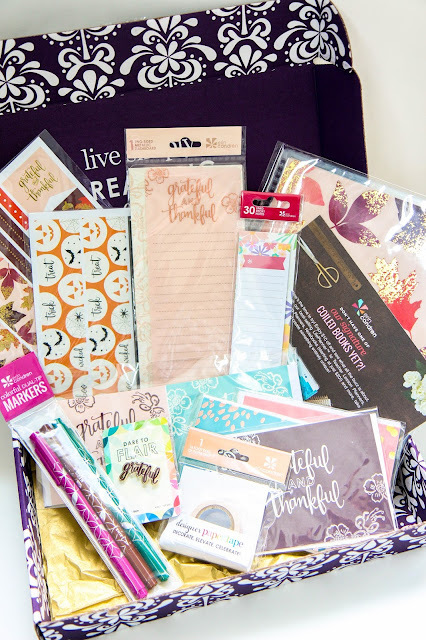 I'm a bit biased about this box since fall is my favorite time of the year, but this subscription is seriously packed with goodness. Plus there are a ton of box exclusive items that make me feel oh so special. Like I'm part of the cool kid's planner club or something. There is an exclusive set of three new shades of the colorful dual-tip markers that I use primarily for my gratitude journal so I'm pumped to add them into the collection. There's also a roll of thanksgiving-esque washi tape that I'm just not crazy about. I've gotten their washi tape in orders before and find it odd and difficult to work with. It feels more like actual paper with an adhesive back than washi tape. The enamel pin did get me pretty pumped though to add it to my always growing enamel pin board. 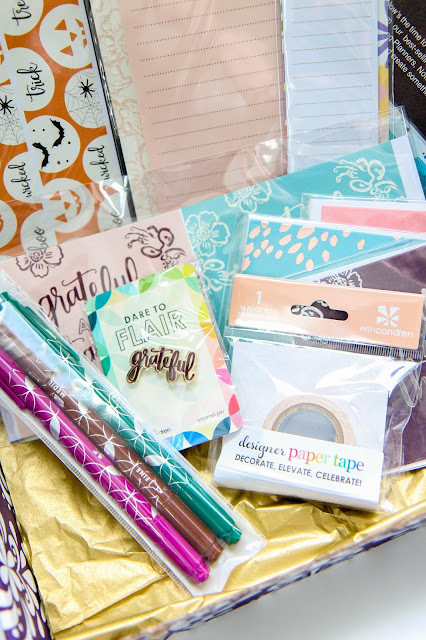 They also included a few of their large gift stickers which are always gorgeous, but definitely items I forget when the time comes to wrap a gift. The box just keeps on going. I feel like they're getting bigger every time with more and more delicious products. Products can be delicious right? The leaf planner cover is probably my favorite thing from the box as my planner has been craving a revamp. 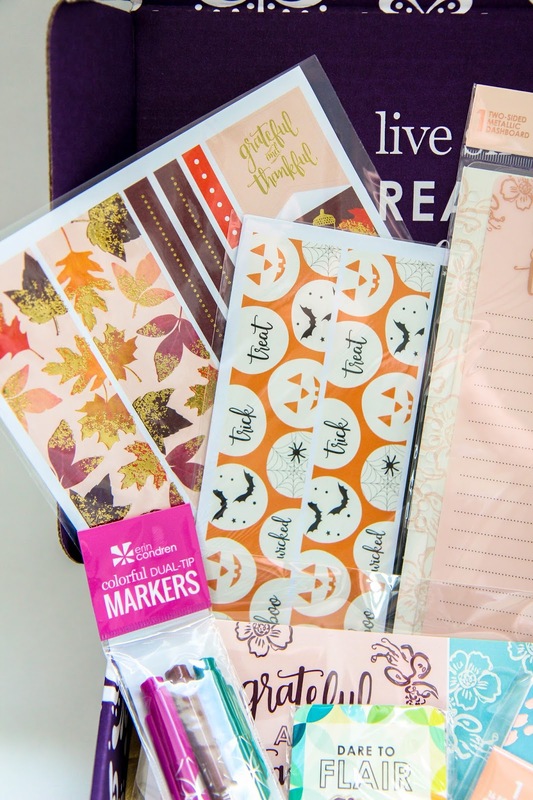 There's a skinny sticky note pack and an autumn themed dashboard. Plus a handful of greeting cards and a coupon code to save $10 off a coiled book. You can get $10 with this link too! Phew. What a box. 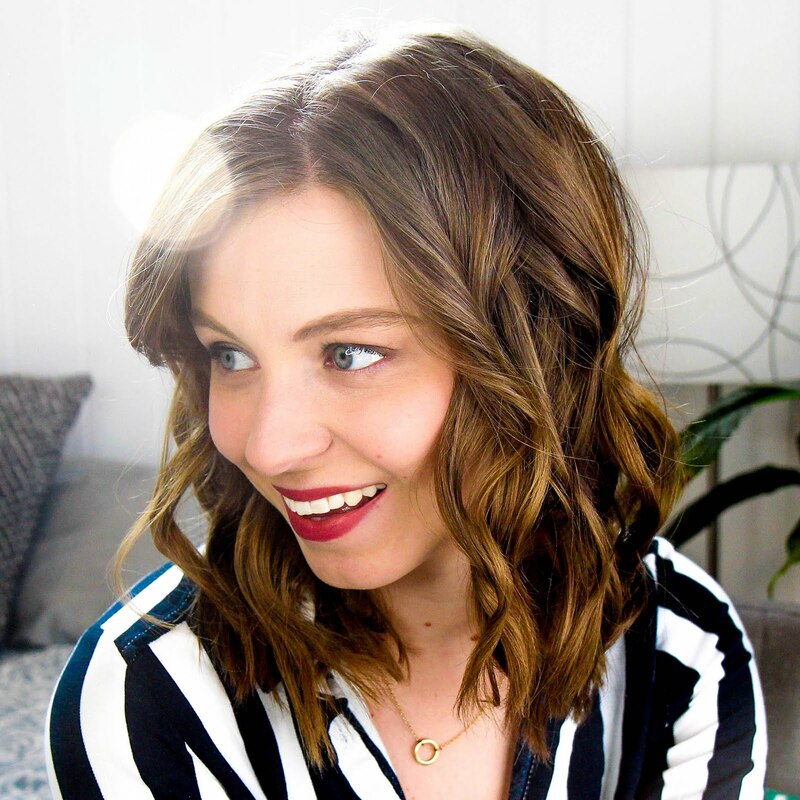 Sadly they're always sold out by the time they ship out to everyone, so you can't snag this one, but I highly recommend it for any planner addicts who are obsessed with Erin Condren products. It's the best way to get a bunch of items for a really reasonable price ($35). Keep a lookout for a giveaway coming soon of the products I'm not interested in! What are your favorite products from this season's box? Did you order one?